LASER TAG is the safe and painless alternative to playing paintball games, so let us bring the action to you with our mobile laser tag. The inflatable arenas, with their interconnecting chambers, create an exciting and naturally darkened maze environment suitable for ages 10 to 100. Afraid of the dark, have younger players (minimum age 7 years, and under 10's will require adult supervision) or limited for space? Then choose either The Caterpillar or the individual inflatable barricades. All ideal for parties, fetes and fun days, indoors or outdoors. AGES 10 AND OVER. Under 10's (minimum age 7) will require adult supervision - or see Individual Inflatable Barricades below. Spacepod 9 Laser Tag Arena has an advantage over other inflatables in that it can keep going – even when it starts to rain! Pod 9 (as it is affectionately known) covers an area of approximately 10 x 10 metres but requires an overall set up area of 13 x 13 metres. The 9 interconnecting chambers create a thrilling setting for the futuristic Crystallite phasers, making Pod 9 an ideal entertainment for fetes and fun days, corporate events and birthday parties. Spacepod 9 can hold a maximum of 10 persons at one time, making it ideal for larger parties of up to 30 players or corporate/weekend events. Please note that although the arena can continue to operate during the onset of rain or rain showers, it is not suitable for adverse weather conditions as the safety and comfort of the players and staff must be taken into consideration. Also, due to its size it is unable to be set up indoors. The little brother of spacepod 9, this 10 room arena will boldly go where his big brother cannot fit as it only covers an area of 8½ x 5 metres. The 10 smaller interconnecting chambers also create the exciting, naturally darkened maze environment. Spacebug 10, together with the futuristic Crystallite Phasers, is ideal for parties indoors or outdoors, or for the smaller fete or fun day. Spacebug 10 will hold a maximum of 6 persons at any one time, for parties of 12 to 18 players. Please note that although the arena can continue to operate during the onset of rain or rain showers, it is not suitable for adverse weather conditions as the safety and comfort of the players and staff must be taken into consideration. 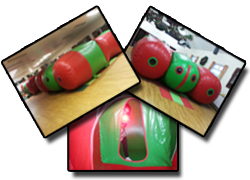 The Caterpillar has joined our group of laser tag arenas to cater for the younger player or those not wanting to venture into the dark. The 12 interconnecting chambers are lighter and the viewing windows enable spectators to watch the action inside. Covering an area of only 7.5 x 5 metres, it can fit into most village halls and the bigger gardens. Want to invite more players? Or just simply want more rooms? Then book both our Caterpillar arenas with the interlinking tunnels to create the 26 room, double entrance arena covering an area of 12 x 7 metres. The Caterpillar (Single) will hold a maximum of 6 persons at any one time, for parties of 12 to 18 players. The Caterpillar (Double) will hold a maximum of 10 persons at any one time, for parties of 20 to 30 players. AGES 7 AND OVER. (As the Barricades are open plan, we are able to provide the adult supervision. However. over larger areas additional adult supervision will be required). As an alternative to the arenas, the barricades can be set up in almost any reasonably sized garden or indoor venue. As the laser tag play is out in the open, these are suitable for the younger player or those afraid of the dark. The barricades and the futuristic Crystallite Phasers are ideal for birthday parties indoors or outdoors. The barricades are suitable for 6 persons playing at one time, perfect for parties of up to 18 players. Our party packages are available from £95 and can be tailored to suit your needs perfectly. Our experienced staff will be on hand throughout to ensure the smooth, safe, fun and stimulating running of the occasion. We offer a variety of gameplay options and degrees of difficulty to suit all age ranges from children's parties to corporate events, and can adapt the games as the party progresses to ensure everyone has a fantastic time. Which means you can leave the entertaining to us! (Please note the prices quoted are for the central Cornwall area where we are based and do not include food or venue hire). Inflatable barricade party packages available from £95. 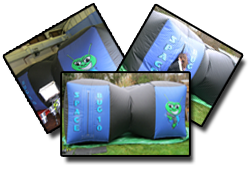 Spacebug 10/Caterpillar (Single) packages available from £140 for a minimum one and a half hour party. * Price quoted for peak season weekends - discounts and offers available for off-peak, weekdays and evenings. 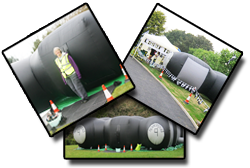 Spacepod 9, Spacebug 10, the Caterpillars and the inflatable bunkers are available for a variety of fund raising events and school fetes with NO BOOKING FEE. A proportion of the day's takings are donated to your event, to be agreed prior to the event. For enquiries and further information please don't hesitate to contact us!